Farkle is a game I received for my birthday (thanks Elana and Shmuel! ), and has quickly turned into my goto distraction when I've got a willing partner and a few minutes (or more!) to play. Heck, I tossed it into my coat pocket when we went out to dinner a few nights ago just in case we had time to kill while waiting for a table. In my defense, I have the pocket edition which is no bigger than an old school 35mm film canister. The game play is easy once you figure out a few basic rules. Essentially you're rolling dice, keeping score and deciding if you want to risk another roll. It kind-of-sort-of reminds me of craps, though it's much simpler to play and doesn't usually involve betting. 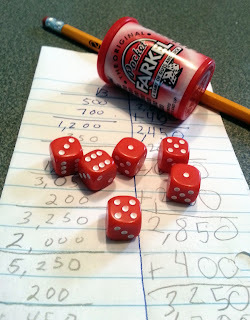 Farkle is easy enough to play that our 8 year old can get into, yet it's intriguing enough that adults will want to play too. Speaking of our 8 year old, the game gives an excellent opportunity to practice adding fairly large numbers (between 0 and 10,000) and has been a great hidden learning tool. You can start a game in a minute or two, pause it, and return to it later, which makes it a great kids activity when you've got only a few minutes to kill. I imagine it would make a fun party game because you can play it in a group and it doesn't require a heck of a lot of concentration to play. You can purchase an official Farkel set, but if you can track down 6 dice you'll have exactly the same thing. I've checked, and there are numerous electronic versions of the game for Android, and surely they exist for iOS. If you get clever about using a book and a bookmark to keep score, the game can be played without writing, which makes it Shabbat Friendly. Will Farkle be the last game you ever buy? Of course not. But as a casual game goes, it's hard to beat.